Key Take-away: PM Abadi faces resistance over how to address Iraq’s debilitating financial situation caused by a sharp drop in oil prices. The 2016 federal budget is a hotly-contested piece of legislation, as it allocates funding for government ministries. PM Abadi and the Council of Ministers (CoM) approved a draft budget on October 19 and submitted it to the Council of Representatives (CoR) for approval. The CoR will begin reading the budget after the CoR Finance Committee reviews it, a process that does not have a set timeline. PM Abadi and his opponents, including Iranian-backed Iraqi Shi’a militias, are at odds with how much of the budget should go to the militias within the “Popular Mobilization,” whose allocation decreased from the 2015 budget. Iranian proxy militias are thus demanding that PM Abadi increase the share for the “Popular Mobilization.” PM Abadi also introduced a new salary scale to reduce expenditures and increase the pay of the poorest government employees. This has led to a backlash against PM Abadi’s reform agenda, including from his most powerful supporter, Grand Ayatollah Ali al-Sistani, and from PM Abadi’s primary political opponent, Vice President Nouri al-Maliki. The final salary scale will likely be heavily modified from its current form and less effective in reducing expenditures. PM Abadi’s opponents will use his unpopular measures to obstruct his reform agenda. Maliki in particular will exploit discontent among political blocs with the reform agenda in order to undermine PM Abadi’s authority and bolster his own prominence and profile, and has begun assembling a still-small coalition with potential to vote no-confidence in PM Abadi. PM Abadi’s political opponents consider PM Abadi’s current strategy to address Iraq’s financial crisis unacceptable. Iranian-backed Iraqi Shi’a militias and supporters of Vice President Nouri al-Maliki oppose the proposed allocation of funding to the “Popular Mobilization” in the federal budget, whose full text has not been released. However, Finance Minister Hoshyar Zebari stated that “20 percent” of the budget pertains to defense. This includes funding allocated to the both the Iraqi Security Forces (ISF) and the militias in the “Popular Mobilization.” Early reports indicate that the budget allocates less funding to the “Popular Mobilization” than the 2015 budget. This number will be significantly less than what notable militia figures requested by up to a third. Kata’ib al-Imam Ali, a powerful Iranian-backed Iraqi Shi’a militia, claimed that the budget allocated only 2.16 trillion. Iraqi dinars as opposed to the 6 trillion. Iraqi dinars in the 2015 budget, or more than 5bn. USD. The figures are likely incorrect, as more reliable reporting puts the “Popular Mobilization” budget allocation for 2015 at 1 billion. USD. Nevertheless, the complaint demonstrates the degree to which the proxy militias and the Iraqi government disagree over the appropriate size of the money allocated for the “Popular Mobilization.” In particular, prominent Iranian proxy militia leader and designated terrorist Abu Mahdi al-Muhandis openly criticized the budget and pinned the blame on PM Abadi. Muhandis insisted that he repeatedly told PM Abadi about the need to increase “Popular Mobilization” funding. An increase in “Popular Mobilization” funding would give the “Popular Mobilization” greater capabilities and heighten their profile at the expense of the ISF. The decrease in funding for the “Popular Mobilization” comes as part of government-wide austerity measures stemming from Iraq’s acute financial crisis. The figures for the 2016 budget are based upon the price and production of oil, which the budget identifies as 45 USD per barrel. The budget also projects an increase in oil production from 3 million barrels per day (bpd) to 3.6 million bpd. The projected oil price is dramatically less than the basis figure for the 2015 budget, which assumed that the price of oil was 80 USD per barrel. This was unrealistic, as Brent crude prices dropped under 50 USD by the time the 2015 budget passed in January 2015. The smaller budget is technically inadequate, as there is still projected to be a deficit of 21 billion. and 25 billion. USD. The anti-ISIS fight demands so many resources that some ministries have lost significant funding. Muhammad Sahib al-Darraji, the Industry and Minerals minister, complained that his ministry did not receive any funding for 2016 and that he had abstained from the CoM vote on the budget. Al-Darraji is a member of al-Ahrar bloc, which supports PM Abadi’s reform agenda. Other al-Ahrar bloc members did not appear to have abstained from voting. One of PM Abadi’s mechanisms for reducing expenditures has been the second point of contention, and has drawn the ire of the Iraqi street. The CoM passed a comprehensive reduction in salaries for government employees in order to reduce expenses as a reform package separate from the federal budget on October 13. The reductions affect a large number of Iraqis, as 40 percent of available jobs are provided by the government. This sparked a large backlash from government employees across the country. Those employees at the higher end of the salary scale, such as university professors and employees holding higher degrees, viewed the cuts as unfair. Some of these higher-earning employees saw their salaries reduced by nearly 20 percent. University professors and employees subsequently staged protests or in some cases gone on strike in Basra, Diwaniya, Muthanna, and Baghdad. The ensuing backlash is indicative of the first real loss of support from the Iraqi street for PM Abadi. His reform program had otherwise enjoyed widespread support, despite its vastly diminished momentum. Protests against the salary scale have been sporadic and involved few participants thus far, in particular because government employees with the smallest salaries actually received slight pay increases. Salary reductions had also been under discussion for months. The CoM reduced CoM salaries, including PM Abadi’s pay, in July 2015. CoR members later followed suit with a 45 percent reduction in August 2015. PM Abadi first announced the discussions of the new changes to the salary scale on October 5. The discussions involved consultations with the members of the CoM. PM Abadi pointed out that the CoM passed the salary scale changes. The major political parties have representation within the CoM, and thus had prior knowledge and input regarding the shape of the salary scale changes. PM Abadi’s allies also rejected the salary scale changes. PM Abadi’s reform agenda has benefited from the support of the SLA’s two main political rivals within the Shi’a political sphere: the Islamic Supreme Council (ISCI) of Ammar al-Hakim and Muqtada al-Sadr’s al-Ahrar bloc. ISCI has supported PM Abadi’s reform agenda since August 7, and al-Ahrar since August 9. Their support was largely aimed at undermining the SLA and Maliki in order to improve their own influence within Baghdad and southern provincial governments. An ISCI member stated on October 28 that ISCI did not support questioning PM Abadi or ending his premiership. However, an al-Ahrar bloc member criticized the salary scale changes as a “red line” and PM Abadi’s reforms as too slow. The Sunni Etihad bloc also rejected the salary scale and PM Abadi’s lack of consultation regarding the reforms, as did the Patriotic Union of Kurdistan (PUK). Major Shi’a, Sunni, and Kurdish parties likely rejected the salary scale to protect themselves from public backlash after initially agreeing to the changes. After all, the CoM has senior representatives from the major political blocs, whose votes were necessary for the reform package’s approval. More troublingly, Grand Ayatollah Ali al-Sistani’s representative, Abdul-Mahdi al-Karbala’i, rejected the salary scale changes on October 23 in a Friday sermon, calling reductions in the salaries of university professors and educated employees “unfair.” Evidently, Sistani and PM Abadi have not been in lockstep over the required changes to the salary scale. The disagreement is curious as Karbala’i advocated a change to the salary scale in September. Sistani’s support is essential for PM Abadi’s political survival, and the disagreement robs PM Abadi of any realistic chance to see the salary scale changes approved in the CoR in their current form. If the Shi’a religious establishment weakens its support for Abadi, his Shi’a political rivals will sense the opportunity to compete with him for power and influence. PM Abadi’s political opponents have used the most recent reform package to attack PM Abadi for what they view as his unilateral and non-consultative approach to reforming government. Many of PM Abadi’s opponents had already rejected PM Abadi’s October 20 decision to dismiss CoM Secretary Mahdi al-Alaq, a Dawa Party member of the SLA and an acting appointee who had only held the position for two months. Iranian proxy groups like Badr Organization and Kata’ib Hezbollah, as well as prominent Maliki allies like CoR member Hanan al-Fatlawi, were outraged when PM Abadi replaced Alaq on October 20 with a candidate who holds American citizenship who had previously had disagreements with pro-Maliki Dawa Party members. Members of the SLA aligned with VP Maliki wrote a letter to PM Abadi on October 27, criticizing his lack of consultation with political parties on the reforms and his “overriding” of the constitution. The complaints over constitutionality were directed at his attempts to eliminate the VP position that requires a constitutional amendment, which ISW documented in August 2015. The members collectively criticized the salary scale changes and PM Abadi’s reform movement on a whole, and stated that they “withdrew their mandate” from PM Abadi and that they were “no longer responsible” for PM Abadi’s actions. This does not mean that Maliki’s allies are intending to attempt to withdraw confidence from PM Abadi. An SLA member denied that the SLA sought to withdraw confidence from PM Abadi, though prominent SLA members have openly speculated about doing so. The Dawa Party political leadership also reaffirmed support for PM Abadi and the reform agenda on October 30. It would be extremely difficult for Maliki to muster the support within the CoR to even attempt a no-confidence vote. However, Maliki and his allies do not actually intend to pursue this course of action right now. Instead, public threats of withdrawing mandates and speculating about withdrawing confidence are threats aiming to discourage PM Abadi from pursuing any additional reforms without including the SLA in the decision-making process. The SLA letter was the strongest open criticism of the reform movement since PM Abadi launched his first package on August 9. Maliki later openly opposed PM Abadi in a television interview on October 30. Maliki did not specifically mention the salary scale, but he stated that PM Abadi’s reform packages had “no legal force.” He also insisted that the Vice Presidency had not been abolished and that any move to do so would be unconstitutional. The interview was a departure from Maliki’s prior methods of attacking PM Abadi, which largely involved voicing discontent through his allies in the SLA or through coordinated pro-Maliki social media. Maliki will use the rise in vocal opposition to the salary scales to heighten his profile and undermine PM Abadi’s ability to operate independent of Iranian influence and the SLA leadership’s direction. It is highly unlikely that the salary scale will pass a vote in the CoR in its current form considering the opposition from Sistani as well as both PM Abadi’s supporters and opponents. The salary scale will most likely be modified, but pay cuts in some form across the board may be unavoidable as Iraq’s economy continues to falter. Nevertheless, PM Abadi’s opponents will use the highly unpopular salary scale change as ammunition against him and his performance. In particular, Maliki’s cohorts will continue attacking PM Abadi and obstructing his reforms in the CoR. Their obstinacy forms only one component of a larger trend involving Maliki’s attempts to undermine PM Abadi’s power and set conditions for Maliki’s eventual return to power. This trend will intensify as Maliki attempts to use opposition to the salary scale changes against PM Abadi. It is unlikely that the CoR will attempt a no-confidence vote at this time. Nevertheless, Maliki may be able to exploit the current resistance to PM Abadi’s reforms to solidify opposition to additional reforms in the future. This may force PM Abadi to consult with the SLA before submitting any additional proposals. It will be equally interesting to see what results from the 2016 federal budget. Iranian proxy militias and their supporters within the CoR consistently advocate for a massive increase in the budget share for the “Popular Mobilization.” Realistically, any increase for the “Popular Mobilization” will require a reduction in the budget allocations for the legitimate security institutions within the ISF. This will result in friction between PM Abadi and his opponents over access to resources. 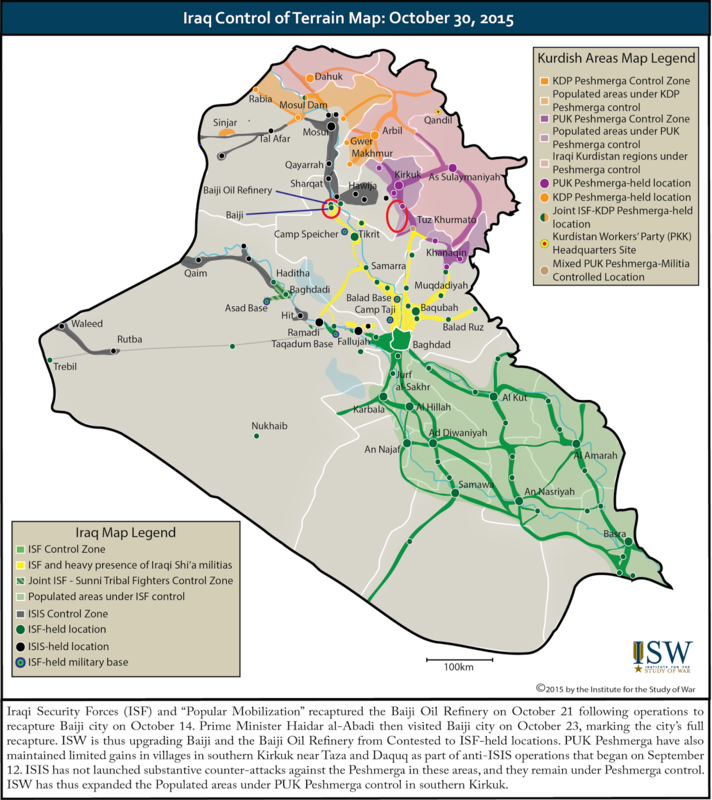 Reallocating resources from the ISF to the “Popular Mobilization” will directly affect PM Abadi’s ability to exercise independent command and control over the security forces by reducing the capacity of the ISF and increasing that of the “Popular Mobilization.” This course of action would result in increased capabilities for militias that are susceptible to Iranian influence. PM Abadi and his opponents competing over access to resources indicate that the budget will not pass the CoR in quick fashion. The Iraqi state and government faces a grave challenge. The budget crisis makes the status quo intractable, but Abadi is not sufficiently powerful to force changes of this magnitude. In fact, the greatest challenges to his premiership come from within his own political bloc. Key Takeaway: The Russian air campaign in Syria reportedly expanded into the southern province of Dera’a one month after Russian airstrikes in Syria commenced. Credible local sources reported that Russian warplanes conducted overnight strikes near Tel al-Harra and other nearby villages east of the Golan Heights in Dera’a Province on October 28. Tel al-Harra is the location of a Russian signals intelligence facility, which was seized by rebels in October 2014. These airstrikes follow reports that the Syrian regime and Hezbollah reinforcements arrived in northwestern Dera’a Province on October 27. The Russian Ministry of Defense (MoD) did not release official airstrike reports for October 29-30. However, credible local activist sources continued to report instances of Russian airstrikes throughout Dera’a, Damascus, Homs, Idlib, and Aleppo. Russian airstrikes largely concentrated around rebel-held areas in the northern Homs countryside and within Aleppo City. Iraqi Security Forces (ISF) and "Popular Mobilization" recaptured the Baiji Oil Refinery on October 21 following operations to recapture Baiji city on October 14. Prime Minister Haidar al-Abadi then visited Baiji city on October 23, marking the city's full recapture. ISW is thus upgrading Baiji and the Baiji Oil Refinery from Contested to ISF-held locations. PUK Peshmerga have also maintained limited gains in villages in southern Kirkuk near Taza and Daquq as part of anti-ISIS operations that began on September 12. ISIS has not launched substantive counter-attacks against the Peshmerga in these areas, and they remain under Peshmerga control. 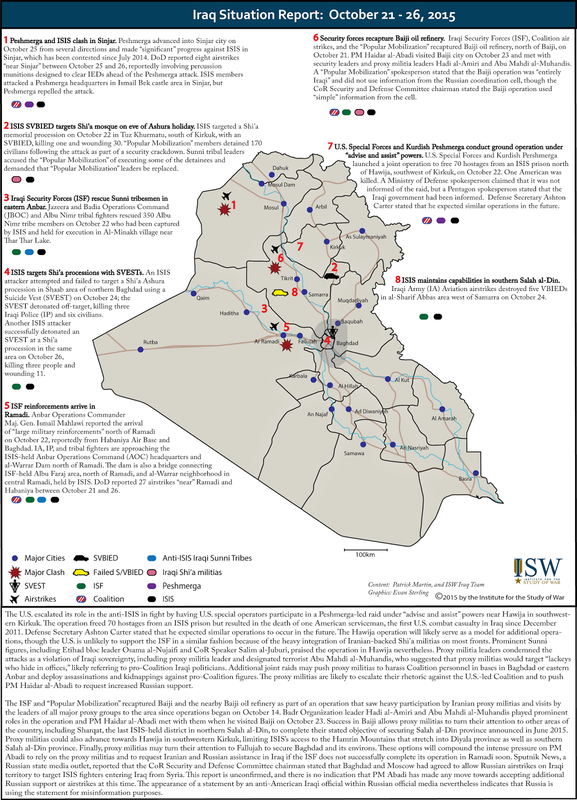 ISW has thus expanded the Populated areas under PUK Peshmerga control in southern Kirkuk. 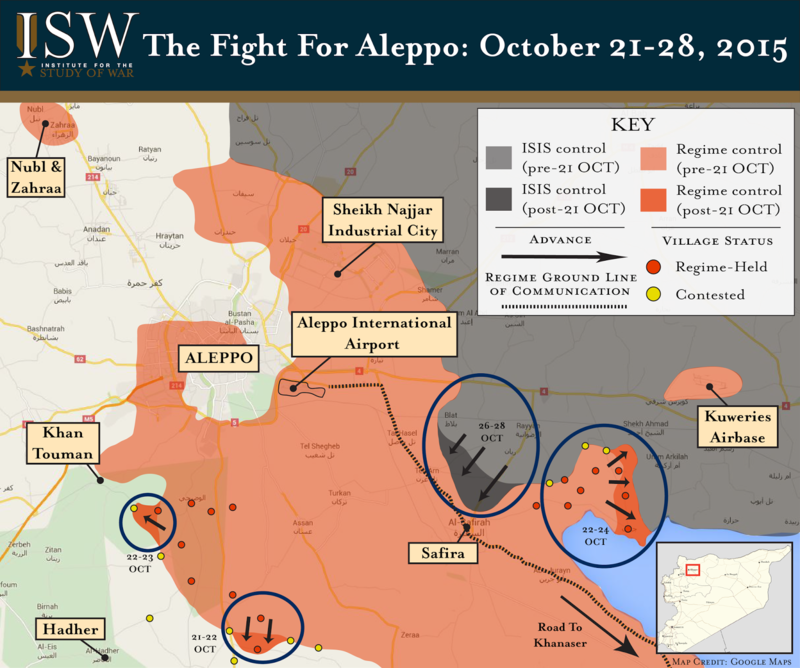 Key Takeaway: Russian airstrikes near Aleppo targeted rebels from October 27-28 as the Syrian regime’s ground offensives suffered setbacks. Syrian regime ground offensives against rebels in the southern countryside of Aleppo and against ISIS near the besieged Kuweires Airbase east of Aleppo City largely stalled following ISIS's offensive against the regime-held town of Safira in the southeastern Aleppo countryside on October 26. Russian airstrikes, however, largely concentrated in rebel-held areas south of Aleppo City and within the city center according to local activist reporting. 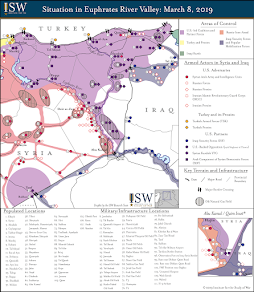 Rebel forces have historically leveraged ISIS’s offensives against the regime in Aleppo in order to advance against both the regime and ISIS elsewhere in the province. The intensity of Russian airstrikes in Aleppo may limit the Syrian opposition’s ability to capitalize on the regime’s stalled offensive. Iranian state news claimed that Russian warplanes targeted ISIS and Syrian al-Qaeda affiliate Jabhat al-Nusra near the Syrian Golan Heights on October 28. Local reporting in Syria has not yet substantiated these claims. ISW therefore does not assess these strikes with even low-confidence at this time. If confirmed, Russian airstrikes in southern Syria could be a sign of Russian cooperation with Israel and Jordan after both countries established independent coordination “mechanisms” with Russia on September 21 and October 23, respectively. The strikes could alternatively represent an escalation against Syria’s southern neighbors if not coordinated with Amman and Tel Aviv. ISIS launched a multi-phase counterattack against the Syrian regime and its allies in Aleppo Province which threatens the regime’s control over its primary ground line of communication (GLOC) to Aleppo City. ISIS seized multiple checkpoints along the highway between the towns of Khanaser and Ithriya in southern Aleppo Province on 23 OCT. These gains blocked the route used by the Syrian regime to deploy reinforcements to Aleppo from Hama and Homs Provinces. ISIS subsequently initiated a major attack targeting the key regime-held town of Safira southeast of Aleppo City. Safira serves as a key node for Iranian military activity in Syria. The town also contains a complex of strategic defense factories implicated in the production of chemical weapons and ‘barrel bombs’ for the Syrian regime. ISIS fighters have reportedly advanced into the far-northern outskirts of Safira despite initial deployments of regime reinforcements to the area. Key Takeaway: The Russian Ministry of Defense (MoD) resumed reporting of airstrikes in Syria on October 26, following a hiatus of reports about airstrikes from October 23-25. The Russian MoD claimed to carry out “59 sorties” from October 24-26 in the Syrian provinces of Idlib, Latakia, Homs, Damascus, Aleppo, and Deir ez-Zour. Russian airstrikes from October 25-26 largely supported regime ground offensives against Syrian rebels near the al-Ghab Plain in northwestern Hama Province and south of Aleppo City. Meanwhile, ISIS captured sections of the road between Khanasser and Ithriya in southeastern Aleppo Province from October 22-26 and claimed to sever the regime supply route to Aleppo City amidst ongoing regime advances near the besieged Kuweires Airbase east of Aleppo. The Russian MoD claimed airstrikes near the city of Palmyra in central Syria; however, local reporting has not yet substantiated these claims. ISW therefore does not consider the Russian MoD reports concerning Palmyra to be credible at this time. 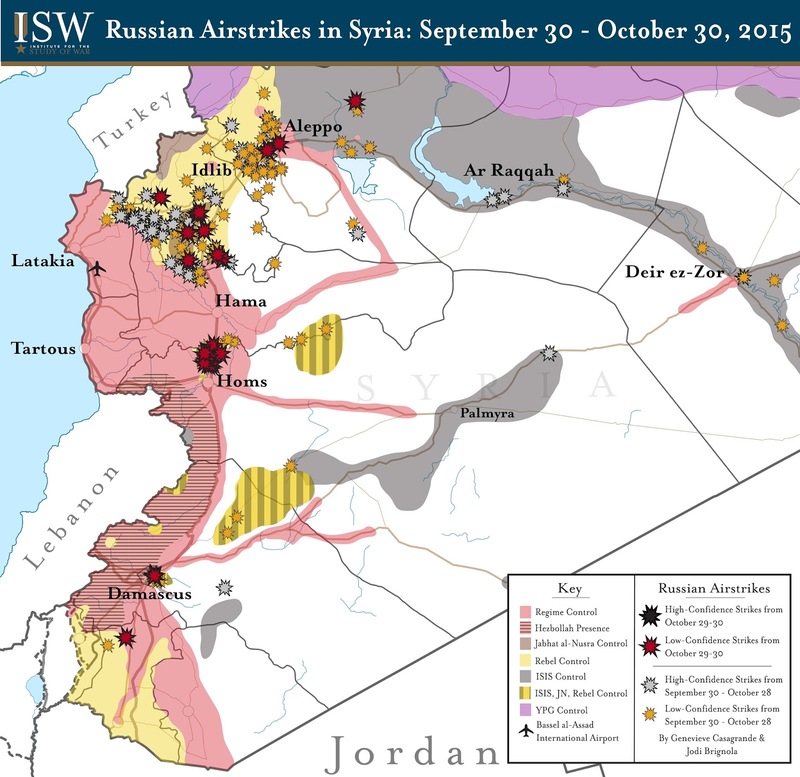 No high-confidence Russian airstrikes occurred against ISIS’s positions during the reporting period. Meanwhile, the U.S. Coalition did not report airstrikes in Syria from October 24-26, an unusual break in the pattern of reported airstrikes following the U.S.-Russian MOU concerning air safety protocols over Syria. Russia continued its disinformation campaign in an effort to present itself as a constructive force in Syria. Russian Foreign Minister Sergei Lavrov announced on October 24 that Moscow is willing to provide air support to Western-backed Free Syrian Army (FSA) groups if the U.S. shares intelligence on the locations of both FSA-affiliated groups and “terrorists.” The majority of Russian airstrikes in Syria to date have targeted rebel forces throughout Syria, however, undermining the credibility of Russian rhetoric regarding cooperation with the moderate FSA-affiliated opposition. Russian warplanes have targeted several moderate U.S.-backed TOW missile recipients since the start of the Russian aerial campaign in Syria on September 30, including Liwa Suqour al-Jebel and Tajamu' al-Izza in the provinces of Idlib and Hama, as well as the Martyr Lieutenant Ahmed Abdou Battalion in Damascus and the First Coastal Division in Latakia. Human Rights Watch released a report on October 25 detailing a Russian strike targeting the home of a commander in the FSA-affiliated Islamist Harakat Tahreer Homs, killing 59 civilians. Key Takeaway: The Russian Ministry of Defense (MoD) discontinued the release of official reporting on airstrikes in Syria from October 23 – 24 amidst reports of high civilian casualties. However, credible local sources continued to report instances of Russian airstrikes throughout Aleppo, Latakia, Idlib, Hama, Homs, and Damascus Provinces. Russian airstrikes reportedly hit three separate hospitals in the provinces of Idlib, Hama, and ar-Raqqah since October 20, including a strike against a hospital in the town of Al Latamneh in northern Hama on October 23. The Syrian Observatory for Human Rights claimed on October 23 that Russian airstrikes resulted in the deaths of almost 151 civilians in Syria. These reports come in direct conflict with the Russian MoD’s insistence that airstrikes are not targeting populated locations in Syria. Several international actors including partners within the U.S.-led anti-ISIS coalition recently changed or clarified their narratives concerning the future role of Syrian President Bashar al-Assad in any political settlement to the Syrian Civil War. The shift in narratives has likely been driven by the Russian intervention into Syria and its concurrent outreach to U.S. regional partners. 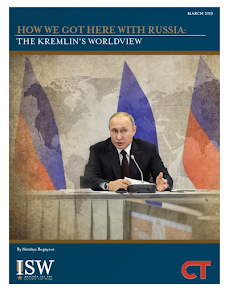 These changes constitute a metric for measuring the increasing influence held by Russia over Middle Eastern security concerns relative to the U.S. ISW previously published key statements by international actors including Russia, Iran, Turkey, Saudi Arabia, the European Union, and the U.S. on September 30, in order to capture the emergent shift in attitudes. This post provides an update to significant statements regarding international leaders’ positions on Syrian President Bashar al-Assad between September 30 and October 24. The U.S. and several of its regional partners have begun to coalesce around a proposal for a political transition which would permit Assad to retain his position in a limited capacity for up to six months in exchange for guarantees of his ultimate departure. Turkey and Saudi Arabia in particular softened their demands for an immediate departure of Assad and privately expressed an ability to tolerate his temporary presence in a transitional government. Russia and Iran nevertheless continue to defend Assad as the legitimate ruler of Syria while their military forces change conditions on the ground in his favor. Several regional powers normally aligned with the U.S. including Egypt and Jordan established military cooperation agreements with Russia that may move them closer to the Russian position on a negotiated settlement to end the Syrian Civil War. United Kingdom – The United Kingdom reaffirmed its willingness to accept a temporary role for Assad in a transitional administration in exchange for a successful settlement to the conflict. European Union – The European Union released a joint statement on the Syrian Civil War which attempted to merge the differing stances towards Assad held by Europe. France maintains a strong position calling for the removal of Assad while Germany and several other European states have been much more reticent in their approach. Russia – Russian attempted to portray itself as a neutral actor in the Syrian Civil War through hints that Assad may depart as the leader of Syria over the long-term. Nonetheless, Russia continued to defend the legitimacy of Assad and the Syrian regime as a whole. Saudi Arabia – Saudi Arabia softened its position on Assad by expressing an ability to tolerate his presence in a transitional government for several months. This apparent shift conflicts with other statements reflecting persistent Saudi demands for Assad’s immediate departure. Foreign Minister Adel al-Jubeir: 22 OCT – [On whether Assad could play a role in an interim Syrian government] “His role would be to leave Syria... The best case scenario is that we wake up in the morning and Bashar al-Assad is not there." Turkey – Turkey also softened its stance on Assad following diplomatic talks with the U.S. and other partner nations, acceding to a transitional administration which preserves Assad as a titular head of state for up to six months. Iran – Iran mirrored Russian rhetoric on the future role played by Assad in a reflection of the deepening strategic alignment between the two countries over the Middle East. Key Takeaway: Russian airstrikes continue primarily to target rebel-held terrain in support of Syrian regime ground offensives in northwestern Syria. 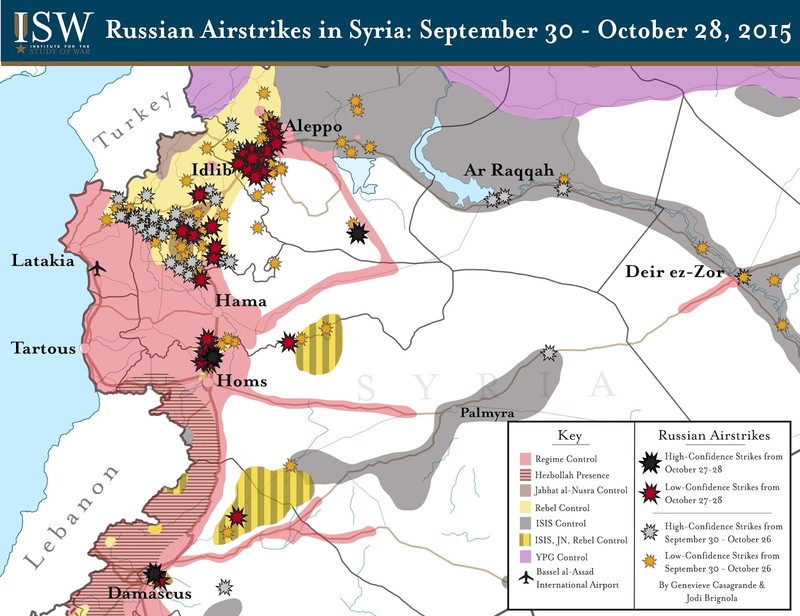 Russian airstrikes from October 19-20 largely supported regime ground offensives in rebel-held areas of the southern countryside of Aleppo and northern Hama Province far from core ISIS-held terrain. However, Russia continues to sustain its counter-ISIS narrative by claiming sporadic strikes against ISIS in Deir Ez-Zour and Raqqa Provinces. Russian Ministry of Defense (MoD) reported two strikes against ISIS in Deir ez-Zour Province from October 21-22. However, only one strike was verified through local reporting on October 21. Russian airstrikes reportedly hit a hospital in ar-Raqqah City on October 22. Local sources released pictures of damages to the hospital and surrounding buildings. However, the Russian MoD has not yet confirmed the strike, or any strikes from 1:00PM EST on October 22 and 3:30PM EST on October 23, claiming a technical problem with its website. The Russian air campaign in Syria increases the Assad regime’s asymmetric capabilities against the Syrian opposition. Like the Assad regime, Russia is likely willing to inflict heavy civilian casualties in the process. Operation Inherent Resolve Spokesperson Col. Steve Warren reported the Russian use of cluster bombs in populated locations in Hama and Idlib Provinces, citing open source reports during a Department of Defense Press Briefing on October 21. Human Rights Watch released a report documenting the use of Russian cluster munitions on October 4, 2015 targeting the rebel-held village of Kafr Halab in northwestern Syria. However, Human Rights Watch could not determine whether the Russian-made munitions were dropped by Syrian or Russian aircraft. Pro-regime aircraft also used cluster munitions in Hama Province on October 11, according to local activist reports. ISIS escalated efforts to inspire terror attacks in Israel over the past week, through digital and possibly in-person recruitment. The organization released a wave of 10 propaganda videos between October 17 and 20 inciting Muslims in Israel and Palestine to attack Israelis, Fatah, Hamas. ISIS is exploiting a growing sectarian conflict in Jerusalem focused on access to the Al Aqsa mosque, a significant religious site for Jews and Muslims. Protests in late September regarding Israel’s limitations on Palestinian access to the mosque fueled a recent surge in violent attacks. At least 8 Israelis and 50 Palestinians have been killed in 39 incidents over October, several involving stabbing attacks by Palestinians on Israelis. ISIS referenced the stabbings in its outreach, urging supporters to also consider “explosive devices” and running over enemies. ISIS’s outreach attempts have resonated with some Israeli Arab individuals. Israel’s state-run television station claimed on October 21 that ISIS-linked operatives are recruiting Israeli Arab students attending foreign universities in Jordan and Saudi Arabia. ISIS has already recruited several individuals in Israel since 2014 to fight and live with ISIS in Iraq and Syria, and has inspired a group of supporters to attack Israeli soldiers. Israel also convicted a group of Arab citizens, including four teachers, in July 2015 for allegedly promoting ISIS’s ideology to students. ISIS released its first video by a Hebrew-speaker on October 22, in which a fighter threatened the destruction of Israel’s borders, echoing ISIS’s frequent refrain about overturning state borders. Inflamed conflict between Israeli and Palestinian citizens likely will facilitate radicalization and recruitment, potentially enabling ISIS to resource the attacks it is already encouraging. Note: Some cited material in this update is behind a paywall. Contact author for more information.